Edible Landscapes | Darcy Maulsby & Co. Sample Consumer Magazine Article: Written for Iowa Gardening, a quarterly magazine that provides ideas, inspiration and solutions for Midwest gardeners. Have you ever wanted to get more out of your garden? You can with attractive, edible landscapes that are redefining the concept of local foods. Even better, you don’t need vast spaces or hours of free time to grow fresh food, add seasonal color and create habitat for wildlife. While edible landscaping is as old as gardening itself, dating back to ancient Egypt and Persia, the edible components once common to Iowa’s residential and rural landscapes have been largely lost to the shade trees, lawns and foundation plantings that dominate most properties today. While there are more than 20,000 species of edible plants in the world, currently fewer than 20 species provide 90 percent of people’s food, Everhart noted. This realization is prompting more Iowans to take a new look at fruit and nut trees, vegetables, herbs, flowers, groundcovers and shrubs that produce berries and other edible foods. •Plan before you plant. It may sound obvious, but plant what you like to eat. Also, decide the level of maintenance you’re willing to do. Most edible plants require a little extra watering, pruning, fertilizing and/or pest management. The extra time doesn’t have to be excessive, however. To care for a fruit tree, for example, many only take a few hours a year. • Remember “right plant, right place.” Select cultivars that are adapted to your gardening zone. Many fruits and vegetables do best where they receive at least six hours of full sunlight per day, and most like well-drained soil. Also, spend a little time researching the specific needs of the edible plants you’d like to grow. If you want to raise apple trees, for example, two different varieties are often needed for cross pollination, Everhart said. If you prefer blueberries, they require a more acidic soil than is commonly found in most parts of Iowa. You may need to purchase sulfur to bring the soil pH down to the 4.2 to 5.5 pH range in which blueberries thrive. • Plant with design in mind. Since a trellis system is needed to support grapes, why not use an arbor to provide an attractive entry to a garden or yard? Grapes can also be espaliered (grown flat) to a fence to create a natural screen. Don’t forget to take a new look at the design possibilities of the edible plants you may already be growing. Asparagus fronds, for example, can be used as fillers in floral arrangements. • Don’t beat around the bush. Look around any yard in Iowa, and you’re bound to see a limited palette of ornamental shrubs used as foundation plantings, hedges and specimen plantings. Next time you plant, consider edible options such as gooseberries or currants. These self-fruitful shrubs can be grown as foundation plantings, small or medium hedges or used in a mixed shrub border. The fruit can be eaten fresh or made into jam, jelly, pie or sauce. ISU Extension’s recommended gooseberries for Iowa include ‘Poorman,’ ‘Welcome’ and ‘Hinnonmaki Red.’ Good currants for Iowa include ‘Perfection,’ ‘Red Lake,’ and ‘Wilder.’ Caution--gooseberries and currants can be alternate hosts to white pine blister rust, so they should not be planted near white pines. If you’re looking for an alternative, consider aronia bushes, which are hardy to at least USDA zone 3. Mature plants grow 6 to 8 feet tall and after three years will produce 15 to 20 pounds of antioxidant-rich berries per plant, according to Vaughn Pittz, owner of Sawmill Hollow Organic Farms near Missouri Valley, who likes to freeze the berries and use them in cereals, smoothies, salads, muffins and breads. • Incorporate edible landscaping in unexpected places. Sure you can grow pots of herbs on the patio, but why stop there? Include cherry tomatoes in a window box or hanging basket, plant colorful peppers alongside flowers, mix basil and coleus in a container garden, grow chives around the mailbox or train raspberries up your fence. In your flower beds, rhubarb’s bold red stalks and crinkly green leaves can be a show-stopper, while asparagus can add a light, fluffy backdrop. Instead of lining the outer edges of your flower beds with annuals, add herbs such as thyme, oregano or tarragon. For extra color and added interest, plant purple basil or sage varieties with variegated white and green leaves. • Take a new look at old favorites. From violets to nasturtiums, flowers offer a unique way to add flavor, color, texture and scent to food. “Edible flowers are becoming quite the delicacy,” Everhart noted. The beautiful blue flowers of borage, for example, can be used in salads or as garnishes. Johnny-jump-ups and pansies can be floated in punch, and their petals can be used to color butter. Edible flowers can also be frozen in ice cubes or candied to decorate cakes, pastries and other desserts. • Get children involved. Edible landscaping offers a powerful way to change a child’s view of the world, especially in suburban communities where they normally wouldn’t be exposed to growing food. Edible landscaping can give your children or grandchildren hands-on involvement with nature as they learn about the environment and healthy eating. To make edible landscaping even more appealing to young gardeners, consider growing heirloom vegetables and unique cultivars, including purple beans or striped tomatoes. • Share the bounty. Many trees and shrubs that are commonly used in windbreaks, including the Nanking cherry, serviceberries and the American cranberry bush, bear edible fruit. If you want to use Nanking cherries in a pie or eat the fruit from the American cranberry bush raw or cooked, realize that the wildlife in your area will probably be attracted to the crop, too. “You can share the harvest with the birds—that’s what I do,” Everhart said. • Try something unexpected. Did you know you can grow pecans in Iowa? The hardy “Green Island” variety is suited for northern climates (including Zone 5), Everhart said. Pawpaws, the largest fruit tree native to the United States, are also native to Iowa and can thrive in many regions. If you don’t regularly see a certain type of edible plant raised in your area, however, realize that there’s probably a good reason. Peaches, for example, aren’t reliably hardy in Iowa. • Find ideas and inspiration. Edible plants come in many shapes and sizes and can perform the same landscape functions as ornamental plants. A number of Iowa gardens include excellent examples of edible landscaping, including Reiman Gardens in Ames, the Polk County Master Gardeners’ Demonstration Garden in Urbandale, the All-America Selections Garden at ISU’s Armstrong Research Farm at Lewis and the Bickelhaupt Arboretum in Clinton. 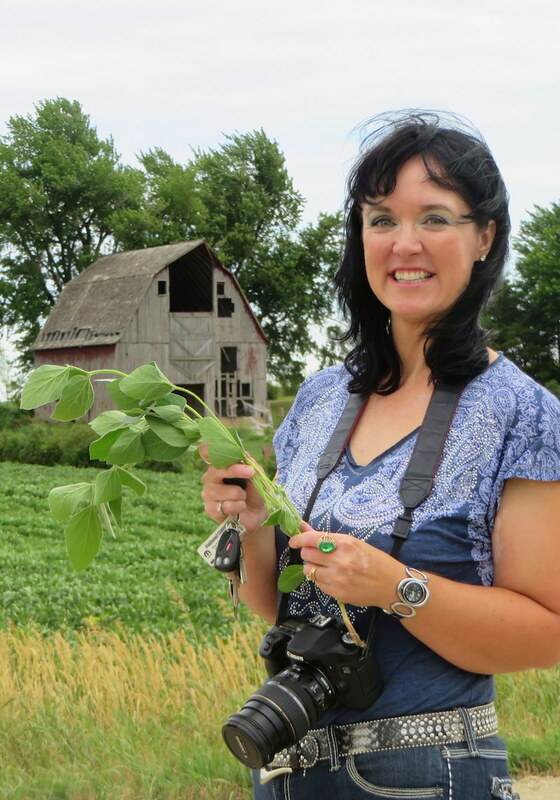 Darcy Maulsby is an Iowa State University Extension Master Gardener who is creating an edible landscape at her rural home near Lake City. Preheat oven to 350 degrees. To chop fresh herbs quickly and easily, place the springs in a cup and snip the leaves with a kitchen shears. Rub tenderloin with oil. Stir together kosher salt, chopped herbs and lemon pepper in a small bowl; sprinkle mixture evenly over surface of the meat. Roast, uncovered, for 40 minutes to 1 hour, or until internal temperature (measured with a meat thermometer) reaches 145 to 150 degrees F. Remove pork to a cutting board and cover meat loosely with aluminum foil. Allow the pork to rest for 10 minutes and let the juices redistribute before slicing and serving. In addition to homemade raspberry jam, candied rose petals can make an attractive garnish for cheesecake and other desserts. I pick my rose petals from the Knock Out® rose in the flowerbed in front of my house. Begin by slightly beating one egg-white in a small bowl. Sprinkle a layer of granulated sugar on a small bowl. Dip the rose petals first in egg-white, then in sugar, to coat on both sides. Dry the petals on a rack.